2 HOW DO I MAKE IT? 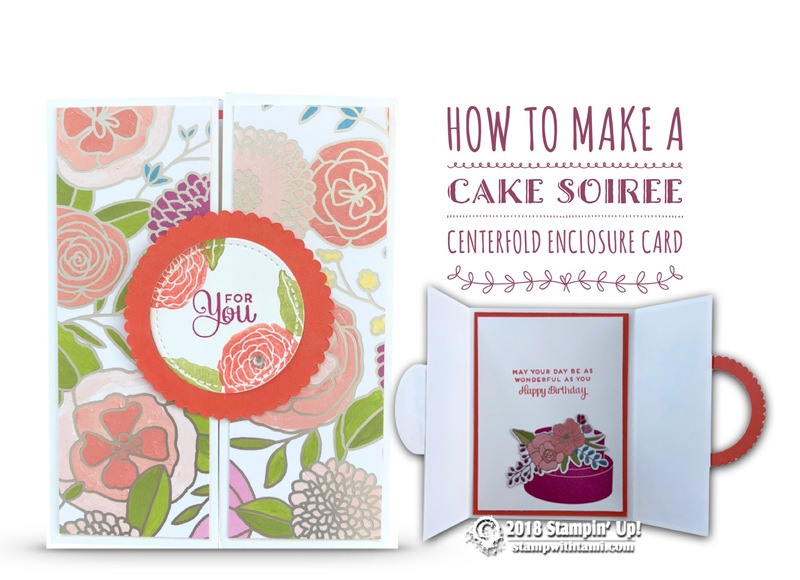 This awesome “centerfold enclosure” fun fold birthday card is part 4 of my Stampin Up Sweet Soiree Suite Series. It’s super easy to make, and just as fun to receive. Designed by Stephanie Jandrow. NOTE: Since it’s school vacation week for my son, we are off looking at colleges. I will not be doing my regular Tuesday Facebook Live class today. 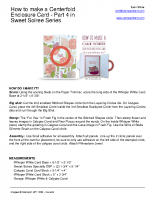 Instead of a video, I have instructions below on how to make this fun card. I will be back on Friday at noon EST with my next class. I thought it would be fun to do a giveaway, even though I won’t be live today. So I’m shaking it up and doing a little different Prize Patrol today. Be sure to check out the details below and visit my Facebook Page to enter. Score: Using the scoring blade on the Paper Trimmer, score the long side of the Whisper White Card Base at 2-1/8″ x 6-3/8″. Big shot: Cut the 2nd smallest Stitched Shapes circle from the Layering Circles die. On Calypso Coral, place the 4th Smallest Circle inside the 3rd Smallest Scalloped Circle from the Layering Circles dies and run through the Big Shot. Stamp: The “For You” in Fresh Fig in the center of the Stitched Shapes circle. Then stamp flower and leaves images in Calypso Coral and Pear Pizazz around the words. 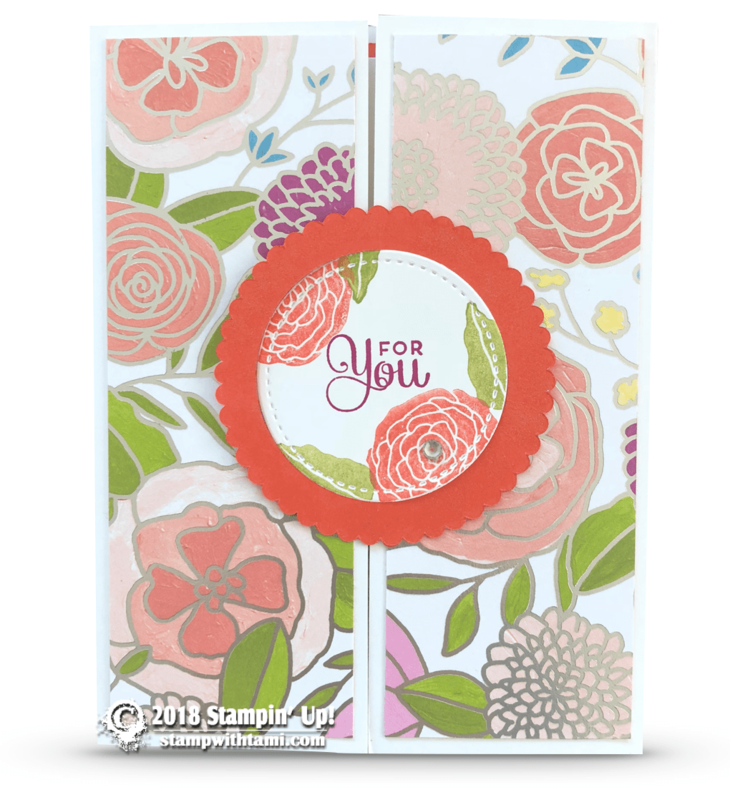 On the inside Whisper White panel, stamp the greeting in Calypso Coral and the Cake image in Fresh Fig. Use the Wink of Stella Glimmer Brush on the Calypso Coral circle. Assembly: Use Snail adhesive for all assembly. Attach all panels. Line up the 2 circle panels over the front of the card for placement, be sure to only use adhesive on the left side of the stamped circle, and the right side of the calypso coral circle. Attach Rhinestone Jewel. This versatile suite will be your go-to products for birthdays, weddings, and other celebrations. But look beyond the cake for all-occasion uses–build flowers, send “thinking of you” messages, and more. Since I won’t be doing a regular Tuesday Facebook live class today, so I thought we could have a different kind of fun Prize Patrol. Comment on this post on Facebook with your favorite product(s), stamp set, suite, etc in the 2018 Stampin Up Occasions catalog and be automatically entered to win one of 2 October Paper Pumpkin prize patrols from me. Click here and leave a comment to enter. Hi Lorraine, I just updated the post with the instructions in pdf form for you. Enjoy. Such a cute set! I love the designer paper and colors used for this set. Beautiful card I would like a PDF for this card. Happy college hunting. Love that card! This can be used for many different holidays as well. I LOVE ❤️ this card!!!!! Love these ideas for sweet soirée. Your giving me the crafting bug..